We love territorial red seals, it doesn't matter the denomination, bank of issue, or condition. We have handled lots of them and always enjoy seeing new discoveries. 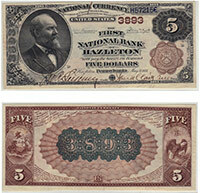 As you might expect, a high denomination like $100 is very scarce. Only three of these are documented as existing today. That total is cumulative of all territorial banks in the country. Needless to say, these are quite valuable. Contact us if you would like to know how much yours is worth. Don't forget to check the serial number. Number 1 notes always sell for nice premiums.